I tagged along with Lucas to one of his African and Indian cooking supply sources, one of many in the Guillotière area of Lyon. The Madras Bazar looks from the outside to be as small as a convenience shop but once you get inside the narrow shop just seems to keep going and going. As you work your way back, it expands into something the size of a small supermarket. You move slowly past the pickle and hot sauces, examining everything carefully of course, and through the spices in bulk. The fresh okra and tamarind root is found near the incense aisle, there is a soft drink section, featuring all manner of ginger beer, malt drinks and tropical fruit cocktails. I located a box of what looks to be the real slimming tea. Score! We will see how that works out. On the way to the checkout, the line for which extends back into one of the first aisles, I was attracted to these bags containing "PAPAPADAM", something I like to crunch with an ice cold Kingfisher at our favorite Indian place. I have always been curious about what's in them, and remarked, upon examining the package, that they don't contain wheat, just urad dal (a kind of lentil), salt, asafoetida, leavening agent, and oil. We both grabbed a pack to try out at home. I pop a couple of them in a hot oven. They turn a golden brown and blister and crispen up in seconds. We enjoy them plain, then with various dips and toppings. I try rolling them while they are soft and hot, and they harden into any form I make. How perfect they are! 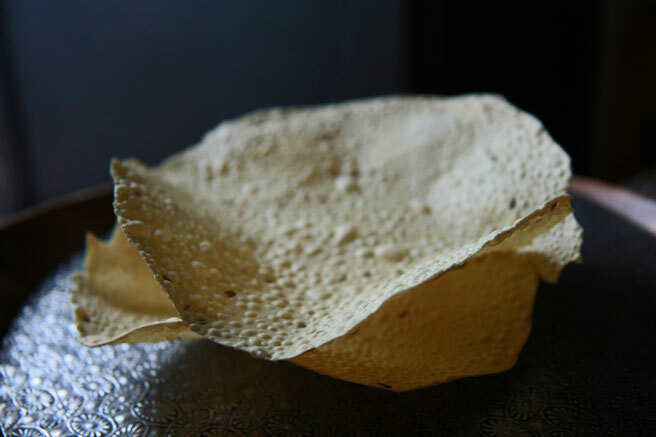 These are Lijjat papads. Oozing with story. In the year 1959, seven women borrowed 80 rupees (that's about $2.00) and made a small batch of papads. They made a pact at that time to never to borrow money again. They began by selling them to a local market vendor. When their first profit came in, they poured it right back into the business. They began to distribute the dough to other women to roll out and dry, and the business grew and grew, keeping with their initial philosophy: Of the women, by the women, for the women. If a woman can work, without distinction of caste creed or color, she can sign on and become a member of the Shri Mahila Griha Udyog Lijjat Papad organization, otherwise known as Lijjat. A cottage industry was born. Today the company has 69 branches, 35 divisions, employs 42,000 sister members all over India, and annual sales last year exceeded $75M, or 3.1 billion Indian Rupees. Read the story of this amazing company here. LOVE that store! They have some fairly decent peanut butters there, if you don't mind a slightly grittier texture. My kids, who haven't had the "real" stuff in quite a while (who can afford those prices with this exchange rate? ), think those PBs are a fine substitute. I bought my first ever ginger beer there too- yum! Have you ever been to the Asian quarter not too far from there? There are several good markets for things that you can't get at Carrefour, that's for sure! At one time, those were my favorite snack. They seemed so much healthier and tastier and way more fun, texturally, than potato chips. I could go through almost an entire package in one sitting. I had no idea about the story, that is amazing! Thank you for posting it. your blog is just beautiful!!! good luck with the slimming tea...i tried one called pu erh and it was absolutely disgusting...tasted like spinach and fish juice...things i usually love - so i decided id rather look like a beached whale than drink it!! please let me no how you got on! !